HomeThe English C. difficile miracle: is it all about fluoroquinolones? The English C. difficile miracle: is it all about fluoroquinolones? A new Lancet ID study suggests that restriction of fluoroquinolone usage has been the main driver of the national reduction in C. difficile infection in England. This paper is challenging in terms of some of the accepted approaches to controlling the transmission of C. difficile: if it’s all about reducing fluoroquinolones (and antimicrobials in general) and nothing to do with these measures, then why invest so much time and energy in isolation of symptomatic cases, cleaning and disinfection etc? Let’s take a moment to reflect on where we were with C. difficile, compared with where we are today. If we look at the peak of the troubles with C. difficile, there were between 50-60,000 cases per annum in England (see the Figure below). This dwarfed the number of cases of other pathogens reported in the scheme. Since then, there has been a remarkable year-on-year reduction up until a plateau of around 15,000 cases per annum reached three for four years ago. There is a general sense that we have got a to background level of C. difficile that is mainly associated with community acquisition. 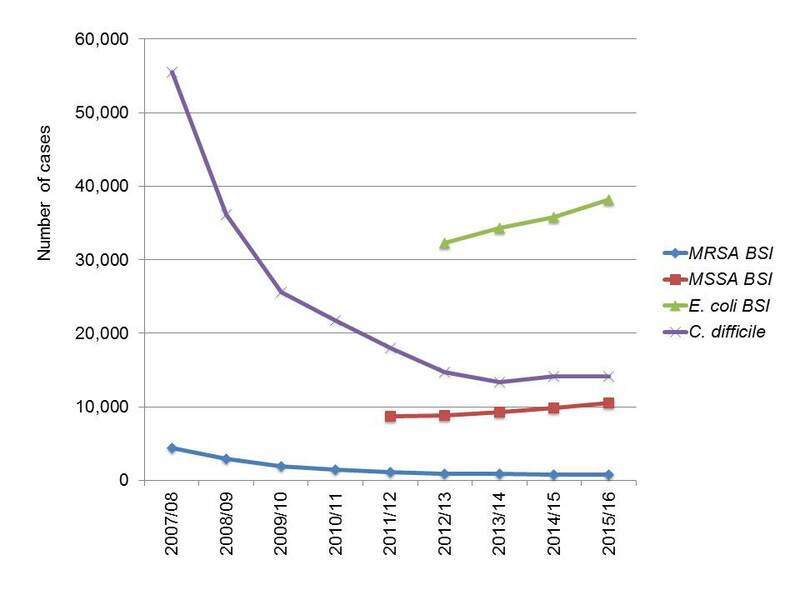 Figure: Trends in HCAI pathogens from PHE’s mandatory reporting dataset. So, what has affected this dramatic disappearing act? The Lancet ID study suggests that it is all about reduced fluoroquinolone use. The study is compelling, showing a strong correlation between reduced fluoroquinolone use and a reduction in C. difficile infection regionally (in Oxfordshire and Leeds) and nationally. However, always important to remember that correlation isn’t the same as causation. Remember that the reduction in C. difficile has also been shown to correlate with increased soap usage! And other interventions (not least improved disinfection) have been shown to reduce CDI in well-controlled studies. One convincing part of the study is that whole genome sequence data demonstrated that the fluoroquinolone-resistant strains disappeared, whereas the fluoroquinolone-susceptible strains remained. However, a similar skewed reduction in different genotypes has happened with MRSA too; EMRSA-16 (the mutliresistant clone) has reduced much more quickly than EMRSA-15 (the less multiresistant clone), for reasons that are not clear. Could it be that the fluoroquinolone-susceptible isolates that have persistent represent the background of community-associated C. difficile that have not been tackled by hospital-based approaches, which have had more impact on the antimicrobial resistant C. difficile genotypes? There’s no doubt that this is a great study (and congrats to the authors, by the way). Reducing the use of antibiotics (especially the high risk ones) is almost certainly the main driver for reducing the transmission of C. difficile. This argues for heavy investment and redoubled efforts towards reducing antimicrobial usage. However, the reductions of CDI in England have been achieved in the context of improving levels of basic IPC. Some patients need antibiotics, so whilst we can go a long way in reducing inappropriate use and making smart choices of the agent to use, we still need a keen focus on reducing the transmission of C. difficile spores. The bottom line is that a lot of things happened more or less at the same time, so we’re never going to know with a high degree of certainty what has affected the English C. difficile miracle. ← Time to go shopping for a UVC system? Jon, thanks for highlighting our study. In terms of understanding the role of infection control interventions we found it intriguing that there was not a fall in the number of fluroquinolone-susceptible secondary cases – cases genetically-linked to a previous case, that could plausibly represent healthcare-associated transmission (in Figure 5). We expected that infection control interventions might have reduced the incidence of these cases, and were surprised it didn’t. Wondered what you make of it? Hi David, always fantastic to have a study author comment on the blog. Great study, congrats. The point about no reduction in secondary transmission of fluoroquinolone-susceptible cases really does point towards reduced fluoroquinolone usage as the key driver. Although I note that there was a 13% reduction in the transmission of fluoroquinolone-susceptible cases that had hospital contact vs. a 15% increase for cases that did not have hospital contact, suggesting that there might be something in my idea about these fluoroquinolone-susceptible cases being more closely associated with community transmission (I accept that these differences were not statistically significant). I guess the question coming from this is…what do we do to prevent these secondary transmissions of fluoroquinolone-susceptible cases? Interesting that Australia has largely escaped (so far) the ‘hypervirulent’ strains of CD, many of which are quinolone resistant. We have long had a nationally co-ordinated policy not to use quinolones where possible – in national guidelines FQ aren’t first line therapy for any empiric indication, there are restrictions under the national pharmaceutical benefits scheme and a ban on use in food producing animals.